We have a whole host of essential products for agriculture and animal husbandry. Among these products, you'll find an excellent range suited to setting up your own electric fencing at Farm & Country Supplies. Instead of employing a physical barrier only, such as those constructed from barbed wire, a fence that has been specifically designed to provide a psychological barrier is often more effective. Fewer posts are often needed, and there is little contact with the fence after the animal's initial learning process. The benefit of this is that electric fences can be moved to suit changing requirements and can last significantly longer than traditional fencing. Farm & Country supplies brings a selection of electric fence rope, tape, posts and accessories to ensure that your livestock or horses are successfully contained. 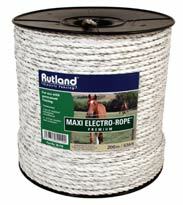 The comprehensive range of electric fence rope from our online shop includes varying colours, specifications and brands such as Rutland's range of electric fence rope that has been tested and proven to be safe for livestock, horses and humans. Particularly popular is our 6 stranded rope that contains six conductive stainless steel strands rather than the more common two or four. This improves the performance of the rope throughout its life. This is produced to be from high visibility material, and is ideal for use with our range of Electric fence energisers, fence posts and insulators and is designed for temporary or permanent paddock fencing. As the steel strands carry a steady and constant electrical current, your electric fence will be effective at all times. Farm & Country Supplies can provide with everything you need to build a long lasting and efficient electric fence. We can help you with the selection of components to make up your electric fence, and we are happy to provide further advice. Just give us a call free on 0800 056 0002; we will be happy to assist further should you need more information on our electric fence rope, or any of our other farming equipment and products.